Objective: Obstructive sleep apnea (OSA) associated health problems are undiagnosed due to the expensive and realistic limitations of overnight PSG examination. In this research, an accurate and resource-efficient biometric index is proposed for remote monitoring of the OSA patients having universal property at all body postures. Methods:In this study, the analysis of 44 subjects determines that the Heart Rate Variability (HRV) parameters including time and frequency domains such as ratio of Standard Deviation of NN interval (SDNN) and Root-Mean-Squared of the Successive Differences (RMSSD), termed as SRR; and LHR (ratio between normalized Low to High-Frequency power) can be taken into consideration to develop reasonable accurate and cost-efficient indexes for OSA levels measurement. for remote monitoring of OSA levels. Obstructive sleep apnea (OSA) is an inhalation chaos, which occurs during sleep due to partially or completely squeezing of the upper airway of the patients [1-3]. Main symptoms caused by apnea disorder are given as high blood pressure, increased heart rate, and poor concentration during work, slower reaction times, extreme fatigue, and a compromised immune system [4,5]. The World Health Organization has stated that approximately100 million people worldwide have OSA . However, less than one-fourth of them are identified being affected of OSA [7,8], it is owing to complicated, and less affordable methods for diagnosing OSA. Therefore, it is much needed to develop an accurate, less complex, and reliable biometric index for monitoring OSA occurrence to the vast extent among affected patients. The typical method to diagnose OSA includes an overnight polysomnography (PSG) examination at sleep labs [9-11]. The PSG information is further used to define indexes such as apnea-hypopnea index(AHI) and respiratory disturbance index (RDI) to signify the occurrence of OSA events. Although PSG is the mainly effectual technique to monitor OSA, however, it is reasonably difficult for patients to be in similar position during the whole night. Furthermore, substantial capital investment is required for PSG examination, because it involves a devoted laboratory, special apparatus, and an attending staff . Several techniques incorporate bio-signal based parameters to analyze OSA instead of utilizing traditional PSG method [13-18]. ECG signal is a mainly noteworthy signal type to study since it sanctions physiological demonstration of OSA events and is suitable to record using wearable sensors [19-21]. Recent innovations in technologies have prompted the growth in remote health monitoring of OSA diagnosis. Thus, contactfree sensors based approaches are developed using infrared and bio-radar for detecting the physiological signals. Pereira, et al. proposed an algorithm for remote monitoring of breathing rate by means of infrared thermal imaging . Kagawa, et al. proposed a method for identifying the three types of sleep apnea on basis of time fluctuating baseline of radar amplitudes . Qi, et al. developed a technique using wavelet information entropy spectrum to judge OSA respiratory signal detected by bio-radar in wavelet domain . However, infrared sensors require strict positional restraints and the region of interest must not be blocked . These constraints are not easily be satisfied during natural sleep. Similarly, the bio-radar, which merges the technology of biomedical engineering and radar for physiological measurement, can be used only for stationary subjects , and it will be difficult to maintain the quality of the signal and resulting in an inappropriate diagnosis of OSA. Thus, contact-free sensors can be good for applications, where subjects are in fix position such as sitting and standing. However, over last decade, several wearable health monitoring systems with the characteristics of comfort, reliability, and sufficient quality, have been designed in hospitals and real-life circumstances. The wearable sensing technology has proved to be a promising solution to assist in acquiring and processing of multiple physiological features in order to provide an early recognition of pathological symptoms and improving the healing rate of disease without superseding in the patient’s daily routine. Hence, it is very significant to propose an effective statistical index which could monitor OSA events for individuals at different body postures in a distinct environment’s. This study aims to develop efficient biometric index using Heart Rate Variability (HRV) for analyzing different OSA levels (server, moderate and mild). The conducted experiment elaborates that the ratio of Standard Deviation of NN interval (SDNN) and Root-Mean-Squared of the Successive Differences (RMSSD) termed as SRR), and LHR (ratio between normalized LF and HF power) are useful indexes for investigating OSA events. This research validates that along with frequency-domain (LHR) approaches of HRV, time-domain (SRR) can also be used for estimating OSA occurrence. From the comparative analysis, it is elaborated that LHR and SRR are resource efficient indexes than those indexes (i-e RDI and AHI) obtained from PSG examination. In this study, Polysomnography (PSG) method is used as a reference to acquiring indexes such as AHI and RDI to signify the occurrence of OSA events. Moreover, SRR is easy to compute, guarantee a high degree of accuracy, resource efficient and ensure better correlation (with RDI and AHI) than LHR. Therefore, this study suggests that SRR obtained from wearable devices can be utilized as a convenient index for remote monitoring of OSA levels. The remaining paper is organized as follows. In Section 2, the efficient biometric index for OSA monitoring is explained. Section 3 includes the architecture of healthcare system for remote monitoring of OSA followed experimental results and discussion in Section 4. Finally, the conclusion is presented in Section 5. In this study, a total of 44 patients (male 28, female 16) aged from 20-68 years were included for examining OSA events. However, 20 of them are for trail experiment, and remaining 24 patients are used for test experiment. The mean and standard deviation of age, height, Body Mass Index (BMI), the weight of subjects is;36.8 ± 11.5 years,165.1 ± 12.3 cm, 28.6 ± 2.5 Kg/m2, 81.8 ± 14.5 Kg respectively. Clinical Ethics Committee of the Xili People Hospital of Shenzhen; China had approved the protocol for this research study. The written informed consent was acquired from every patient before the experiment. This research includes an adaptive QRS detection algorithm to measure calculate the HRV of 44 patients, which is easy to implement on real-time wearable devices developed by our laboratory in a previous study, having 99.3% detection rate to extract RR interval series for HRV analysis. The HRV is computed in time-domain and frequency-domain, based on standards of measurement, developed by the Task Force of the European Society of Cardiology and the North American Society of Pacing and Electrophysiology. The spectral analysis of HRV may offer a quantitative assessment and estimation of the nervous system. The LHR is utilized to specify stability between both components of ANS action (the sympathetic and parasympathetic). Furthermore, statically calculated index of low frequency (LF) and high frequency (HF) can be used to calculate the important factors for autonomic misbalance. Hence, this ratio is very useful for diagnosing OSA. The time-domain analysis is the easiest to perform since they are applied straight to the series of successive RR interval values. Also, several variables that measure the variability within the RR series exist. As ECG signal for heart beats are in the chain of time intervals, therefore the evaluation of HRV in the time-domain has the advantage of the reduction in complexity during its calculation and save more resources. Whereas ; represents R-to-R interval, mean of R-to-R interval and a number of peaks of ECG waveform, respectively. Furthermore, in this study, the relationship of SRR and LHR with OSA events is verified by comparing their statistical correlation with traditional indexes (RDI and AHI). The general architecture of healthcare system for telemedicine includes three tiers as shown in Figure 1. In the first tier, coordinator receives the vital information from the wearable device. The integration of components such as; Intel Galileo Board, HKD-10A sensor, and Wi-Fi module (N-2230) is acting as a medical device to capture ECG signal from the human body (as detailed in our previous work ). For measuring ECG, two electrodes El and E2 are situated on the chest near to heart, while third reference electrode E3 is positioned on right leg. This arrangement enables to produce neat and clean ECG signal having high R-peak amplitude values and QRS complex can be found easily. Furthermore, bio-signal is stored at the server in the second part. However, data transmission time between two ends is approx. 0.20milliseconds. Therefore, remote healthcare is preferred for OSA monitoring for examining critical patients with least possible delay, hence to avoid expensive and complex PSG procedures. In the third part, authorized physician acquires the information from the server. By using a different range of SRR, OSA events can be examined efficiently and accurately by a concerned surgeon at anytime and anywhere. Figure 1: Healthcare System for Tele-Monitoring of OSA. The two discussed indexes SRR and LHR for analyzing OSA levels are obtained from the time and frequency domains measurement of HRV, respectively. In the frequency domain method, a power spectrum density (PSD) based on FFT estimation is calculated for the RR interval series. Furthermore, the ratio between LF and HF, represented as LHR is utilized as first suggested index to decrease the computational complexity and present one of the competent indexes for spotting OSA levels. Figure 2 represents RR-intervals for both the short-term and long-term i-e 5 minutes, 1 hour and a whole night of ECG signal. These RR-intervals are further utilized to calculate HRV at different time durations by using both time domain approaches SDNN and RMSSD. However, owing to the ability of long-term recording, these two methods are favored, because, in a real scenario, health monitoring of patients should be observed for a long time (for several hours). The ratio between SDNN and RMSSD (SRR) as shown in equation (5) is used as the second index for diagnosing OSA. Figure 2: The inter-pulse (RR) interval representation for 5minutes, 1 hour and whole night of ECG signal. To analyze OSA events on basis of AHI and RDI following conditions to be fulfilled: healthy subject (AHI/RDI) < 5; mild (5 ≤ AHI/RDI ≤ 15, moderate (15<AHI/RDI ≤ 30), and severe (AHI/RDI>30) [31-33]. In this study, Polysomnography (PSG) method is used as a reference to acquiring indexes such as AHI and RDI to signify the occurrence of OSA events. Table 1 states that among the trial group, it is observed that seven subjects have severe OSA (RDI >30). By comparative analysis, it can be examined that for these seven subjects LHR ≥ 1.6. Furthermore, RDI is in between 15 and 30 for four subjects, and RDI varies from 4 to 15 for nine subjects that is a condition for moderate and mild OSA events respectively. Table 1: SRR, LHR and RDI for 20 subjects (trial experiment). The LHR for moderate and mild OSA subjects lies in following ranges 0.9<LHR ≥ 1.60 ad 0.2<LHR ≥ 0.8 respectively. Comparative analysis with AHI further verifies this relationship of LHR with different OSA levels during test group examination. It is demonstrated in Table 2, for eleven subjects, AHI is greater than 30, that is a condition for severe OSA. For eight subjects, AHI is in the range of 15-30 (condition for moderate OSA); and for five subjects; AHI lies between 5 to 14 (condition for mild OSA). For LHR, the accuracy between trail group and test group ranges to examine OSA levels is 22/24=0.9166 or 91.66%. In the test group, two subjects (N=5 and N=12) do not obey the ranges as obtained from trail group for LHR index to monitor OSA occurrence. Table 2: SRR, LHR, and AHII for 24 subjects (test experiment). This study demonstrates that SRR is observed to be an efficient biometric index to diagnose OSA levels. In trail group, 7, 4 and 9 are severe, moderate and mild OSA patients as shown in Table 3. For these OSA patients by doing a comparative study of SRR with RDI, it is examined that SRR ≥ 1.8, 1.45<SRRR ≥ 1.8 and 0.4<SRRR ≥ 1.45 for severe, moderate and mild respectively (Table 1). This relationship between SRR and OSA events is further checked on test group examination by referencing AHI as a comparison tool between them having an accuracy of 23/24=0.958 or 95.83%. During test group examination (Table 2) only one subject (N=17) do not comply with the ranges as obtained from trail group for SRR. Table 3: Total Number of patients for trail and test experiments. Although RDI and AHI values have a direct relation with LHR and SRR as observed from comparative analysis, however, they do not have a linear correlation with both of them. Figure 3 represents the correlation of RDI and AHI with SRR and LHR. It has been observed from Figure 3(a) and 3(b) that SRR and LHR have a strong correlation with AHI of (r=0.793) and (r=0.762) respectively. The Figure 3(c) represents that RDI also has good correlation with SRR of (r=0.48). However, no significant correlation (r=0.39) has been observed between RDI and LHR as shown Figure 3(d). 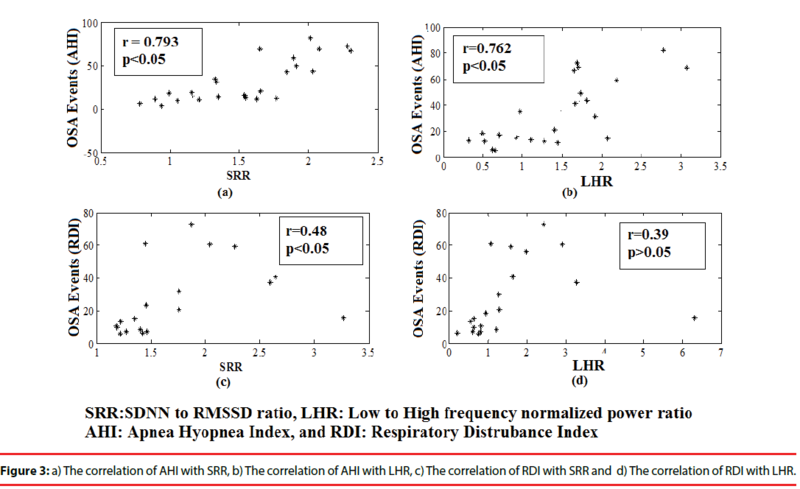 Figure 3: a) The correlation of AHI with SRR, b) The correlation of AHI with LHR, c) The correlation of RDI with SRR and d) The correlation of RDI with LHR. Figure 4 represents that the SRR is the more resource efficient approach for diagnosing OSA levels than LHR and PSG, as the same amount of resources are utilized for more time duration (in hours) using SRR. The PSG is expensive and requires overnight caretaker which consumes some resources. However, frequency-domain based index LHR is resource efficient than PSG but still, demands more resources than time-domain based index SRR. Since the HRV evaluation in the timedomain can reduce computational complexity and save more resources than frequency-domain. Therefore, SRR index has the advantage of resource efficiency over LHR index as well as PSG method. Figure 4: Resource Utilization comparison for PSG, LHR, and SHR approaches. Figure 5 demonstrates that SRR index has high accuracy than all compared methods for examining OSA events. The accuracy of single lead approach , TVAM (Time-Varying Autoregressive Model) , LHR index, sleepAp , and SRR index is 84%, 88%, 91.63%, 92.2% and 95.83% respectively. Due to all these advantages, SRR is more efficient biometric index than LHR and other existing indexes for analyzing OSA events. Figure 5: Accuracy comparisons of different approaches for analyzing OSA. This study presents an efficient biometric index to examine OSA events having applicability in daily life and clinical environment. From experimental results, it can be concluded that SRR and LHR can be more convenient and resource-efficient biometric indexes for diagnosing OSA than existing indexes (RDI and AHI). It is also observed during detailed analysis that LHR has less correlation with RDI and AHI than SRR. Additionally, SRR ensures more accuracy level and resource-efficiency than LHR. Therefore, this study suggests that SRR is an efficient statistical index for remote monitoring of OSA levels. The future work of this research is to perform an experiment on increased number of patients and also to find the relationship of OSA degree assessment with some other time domain as well as non-linear parameters of HRV. This work was supported in part by the science technology and innovation committee of Shenzhen for research projects (GrantJCYJ20160429174426094, JCYJ20151030151431727, JCYJ20150529164154046, SGLH20150216172854731, and SGLH20150213143207911), Science and the Technology Planning Project of Guangdong Province (No.2016A030310129, and 2014A020212257), the Guangzhou Science and Technology Planning Project (No.201704020079), the national Key research and Development Program of China (2016YFC1300300) and the National High Technology Research and Development Program (863 Program) SS2015AA020109. Sannino G, De Falco I, De Pietro G. Monitoring obstructive sleep apnea by means of a real-time mobile system based on the automatic extraction of sets of rules through differential evolution. J. Biomed. Inform 49(1), 84-100 (2014). Chen L, Zhang X, Song C. An automatic screening approach for obstructive sleep apnea diagnosis based on single-lead electrocardiogram. IEEE. Trans. Automat. Sci. Eng 12(1), 106-115 (2015). Chen L, Zhang X, Wang H. An obstructive sleep apnea detection approach using kernel density classification based on single-lead electrocardiogram. J. Med. Syst 39(5), 1-11 (2015). Vizzardi E, Sciatti E, Bonadei I, et al. Obstructive sleep apnoea-hypopnoea and arrhythmias: new updates. J. Cardiovasc. Med (Hagerstown) 18(7), 490-500 (2017). Basoglu OK, Vardar R, Tasbakan MS, et al. Obstructive sleep apnea syndrome and gastroesophageal reflux disease: the importance of obesity and gender. Sleep. Breath 19(2), 585-592 (2015). Álvarez D, Gutiérrez-Tobal GC, Del Campo F, et al. Positive airway pressure and electrical stimulation methods for obstructive sleep apnea treatment: a patent review (2005–2014). Expert. Opin. Ther. Pat 25(9), 971-989 (2015). Al-Mardini M, Aloul F, Sagahyroon A, et al. Classifying obstructive sleep apnea using smartphones. J. Biomed. Inform 52(1), 251-259 (2014). Fekr AR, Janidarmian M, Radecka K, et al. Movement analysis of the chest compartments and a real-time quality feedback during breathing therapy. Net. Model. Analy. Health. Inform. Bioinform 4(1), 1-20 (2015). Griessenberger H, Heib DP, Kunz AB, et al. Assessment of a wireless headband for automatic sleep scoring. Sleep. Breath 17(2), 747-752 (2013). Van de Water AT, Holmes A, Hurley DA. Objective measurements of sleep for non‐laboratory settings as alternatives to polysomnography–a systematic review. J. Sleep. Res 20(1pt2), 183-200 (2011). Song C, Liu K, Zhang X, et al. An Obstructive Sleep Apnea Detection Approach Using a Discriminative Hidden Markov Model From ECG Signals. IEEE. Trans. Biomed. Eng 63(7), 1532-1542 (2016). Ng AS, Chung JW, Gohel MD, et al. Evaluation of the performance of using mean absolute amplitude analysis of thoracic and abdominal signals for immediate indication of sleep apnoea events. J. Clin. Nurs 17(17), 2360-2366 (2008). Almazaydeh L, Elleithy K, Faezipour M, et al. Apnea Detection Based on Respiratory Signal Classification. Proc. Comput. Sci 21(1), 310-316 (2013). Almazaydeh L, Faezipour M, Elleithy K. A Neural Network System for Detection of Obstructive Sleep Apnea Through SpO2 Signal. Int. J. Advan. Comp. Sci. App 3(5) (2012). Sannino G, De Falco I, De Pietro G. An Automatic Rules Extraction Approach to Support OSA Events Detection in an mHealth System. IEEE. J. Biomed. Health. Informat 18(5), 1518-1524 (2014). Chemla D, Attal P, Maione L, et al. Impact of successful treatment of acromegaly on overnight heart rate variability and sleep apnea. J. Clin. Endocrinol. Metab 99(8), 2925-2931 (2014). Alvarez-Estevez D, Moret-Bonillo V. Spectral Heart Rate Variability analysis using the heart timing signal for the screening of the Sleep Apnea–Hypopnea Syndrome. Comput. Biol. Med 71(1), 14-23 (2016). Shouldice RB, O'Brien LM, O'Brien C, et al. Detection of obstructive sleep apnea in pediatricsubjects using surface lead electrocardiogram features. Sleep 27(4), 784–792 (2004). Mendez MO, Bianchi AM, Matteucci M, et al. Sleep apnea screening by autoregressive models from a single ECG leads. IEEE. Trans. Biomed. Eng 56(12), 2838–2850 (2009). Behar J, Roebuck A, Shahid M, et al. SleepAp: An Automated Obstructive Sleep Apnoea Screening Application for Smartphones. IEEE. J. Biomed. Health. Inform 19(1), 325-332 (2015). Pereira CB, Yu X, Czaplik M, et al. Remote monitoring of breathing dynamics using infrared thermography. Biomed. Opt. Express 6(11), 4378-4394 (2015). Kagawa M, Tojima H, Matsui T. Non-contact screening system for sleep apnea-hypopnea syndrome using the time-varying baseline of radar amplitudes. IEEE. Healthcare. Innovat. Conf, Seattle,WA, USA, 99-102 (2014). Qi F, Li C, Wang S, et al. Contact-free detection of obstructive sleep apnea based on wavelet information entropy spectrum using bio-radar. Entropy 18(8), 306 (2016). Yang Z, Xijing J, Teng J, et al. Detecting and identifying two stationary-human-targets: a technique based on bioradar. 1st IEEE. Int. Conf. Pervas. Comput. Signal. Process. App, 981-985 (2010). Wu W, Lee J. Improvement of HRV Methodology for Positive/Negative Emotion Assessment. Proc. 5th Int. Conf. Collaborat. Comput. Network. Appl. Worksharing, Washington, DC, USA, 1–6 (2009). Sollers J, Buchanan TW, Mowrer SM, et al. Comparison of the ratio of the standard deviation of the RR interval and the root mean squared successive differences (SD/rMSSD) to the low frequency-to-high frequency (LF/HF) ratio in a patient population and normal healthy controls. Biomed. Sci. Instrument 43(1), 158-163 (2007). Balocchi R, Cantini F, Varanini M, et al. Revisiting the potential of time-domain indexes in short-term HRV analysis. Biomedizinische. Technik 51(4), 190-193 (2006). Pirbhulal S, Zhang H, Mukhopadhyay SC, et al. An Efficient Biometric-Based Algorithm Using Heart Rate Variability for Securing Body Sensor Networks. Sensors 15(7), 15067-15089 (2015). Pirbhulal S, Zhang H, Wu W, et al. A comparative study of fuzzy vault based security methods for wirless body sensor networks. 10th Int. Conf. Sensing. Tech Nanjing, China 1-6 (2016). Yılmaz B, Asyalı MH, Arıkan E, et al. Sleep stage and obstructive apneaic epoch classification using single-lead ECG. Biomed. Eng. Online 9(1), 39 (2010). Gottlieb DJ, Whitney CW, Bonekat WH, et al. Relation of sleepiness to respiratory disturbance index: the Sleep Heart Health Study. Am. J. Respir. Crit. Care. Med 159(2), 502-507 (1999). Wang N, Li SB, Zhao LS, et al. Relationship between obstructive sleep apnea and coronary microcirculatory function among patients with cardiac syndrome X. Coron. Artery. Dis 25(1), 35-39 (2014).